For many years, I have been a fan of dyeing clothes. I think my dyeing days started years ago when I wanted a pair of solid black jeans. With my statistically extreme ‘out-in-out’ figure, I have always struggled to find jeans that (a) have a high enough rise, (b) fit me in the waist and don’t gape at the back, (c) fit me in the leg, and (d) are a shape/style that I want. But jeans are a whole other post, so I’ll stop there with that topic. Suffice to say that I found it difficult to get a pair of jeans that met all my requirements AND came in a colour other than ‘stonewash’. So, not to be defeated, I would buy several pairs of these jeans and use dye to make them different colours. Of course with dyeing you can’t get the distressed effect that was sooooo trendy several years ago but at least this gave me options as to the colours I wore on my bottom half. Since then, I have dyed many items of clothing. It gives me the freedom to pick styles and shapes that suit me, rather than basing my decision on the colour, as this is something that can easily be changed – dependant on the fabric, of course. I usually use Dylon dyes. They have a wide range of colours available in machine and hand dyes and I tend to buy them either from eBay or my local Dunelm Mill as they are a good price here (currently £4.59 for a machine dye). I’m not going to go into detail on how to dye clothing as there are great instructions included with Dylon dyes and various pages available on the internet. 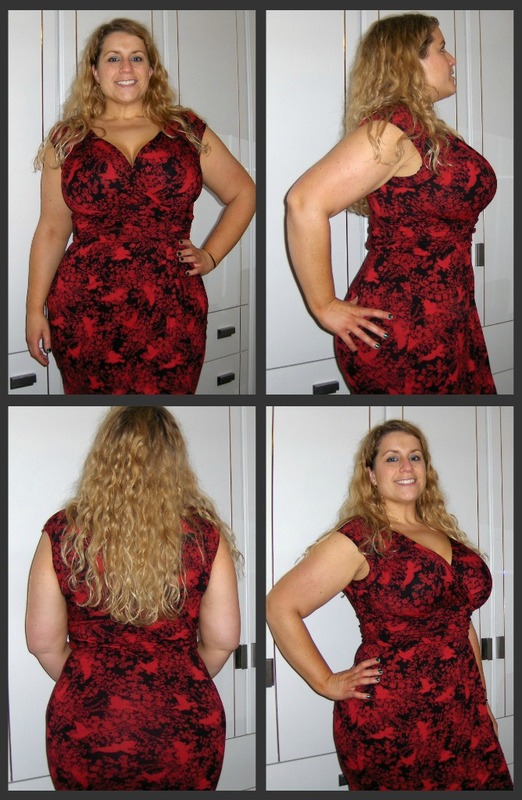 Instead, I am going to show you how using Dylon has given me some more wardrobe options with the Wallis and Dorothy Perkins dresses I bought recently. I LOVE these dresses. 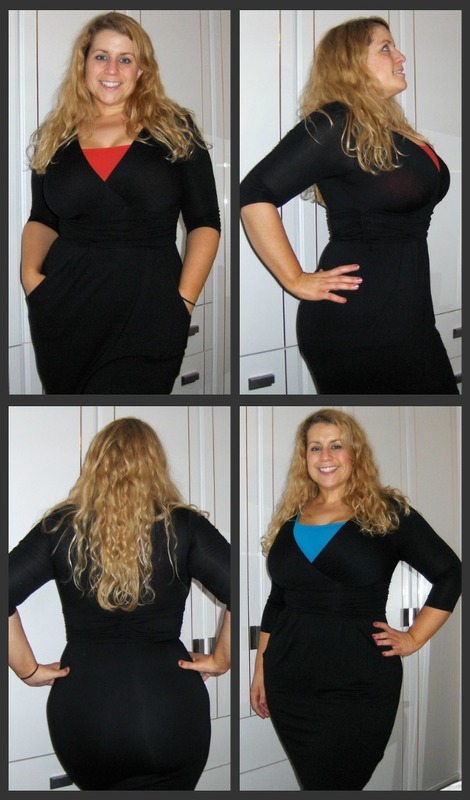 The shape is ideal for me – fitted stretch jersey but nipped in at the waist – and they have a crossover at the bust so I can wear a vest underneath for modesty or go without if I want to have a little more on display. The length is also perfect; I am not a fan of my legs but the dress sits just about on my knee so I can wear leggings or thick tights for a very flattering effect. Photo kindly supplied by the wonderful Diana at Fashion Loves Photos. So, first of all we have the Wallis dresses. These dresses were a bargain at £20 each in the sale so I scoured my local Wallis and BHS stores to find some more. I was thrilled to grab a couple of black ones, which will be great work staples, as well as some more in blue, green and leopard print. I must at this point praise the superb customer service I received a few weeks ago in Wallis, Hempstead Valley. The ladies in that store were super helpful, wonderfully friendly and chatty and even put up with me flashing my Ewa Michalak PL Garden at them while I stood at the till (I was waxing lyrical about how great these bras are – as usual!). Thanks girls – I had so much fun with you all! Perfect! As you can see, it’s easy to change its look by wearing a different vest underneath. I can also accessorise with different jewellery or wear colourful or patterned leggings or tights with it and it would look great. So…what about the dresses I dyed. I started off by dying a blue dress with Dylon’s Dark Green Machine Dye. I hoped that by mixing blue with green I would end up with a teal colour (my favourite!) …sadly this wasn’t the outcome but instead I have a dress in the most gorgeous deep bottle green shade. Fab! 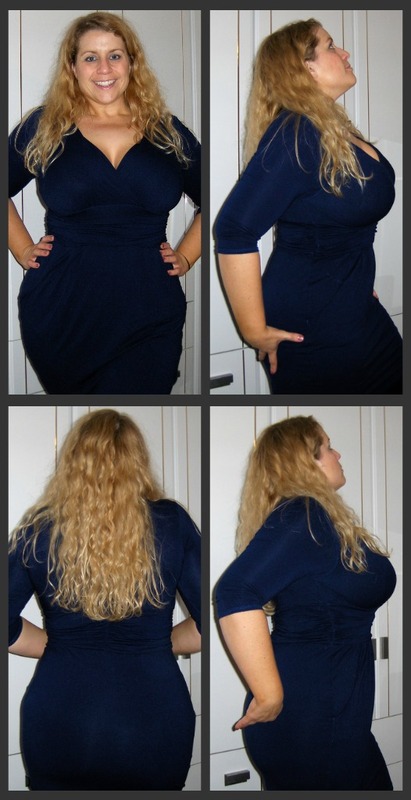 Next, I dyed another blue dress with Dylon’s Fabri Colour in Navy (available instore at Asda here for £3.99). 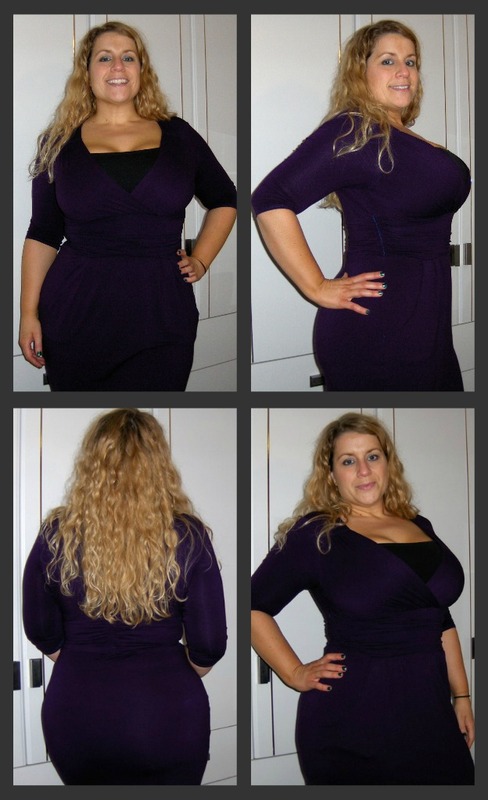 I was so thrilled with the colour of this dress! It’s certainly navy, but rich and vibrant shade. Blue seems to really suit my complexion so this is a real winner. It’s nice to have a dark coloured dress that isn’t black, and again I can easily team a chunky belt with this to change the look. Finally, for now at least, I used Dylon Machine Dye in Burlesque Red on a blue dress. Wow! I have used Burlesque Red on many occasions before and it usually gives a beautiful, deep reddy burgundy colour. However, because the dress was originally blue, the blue and burgundy have mixed together to give the most wonderful purple – like the Dairy Milk wrapper! I was really thrilled when I saw how well this had turned out. I had finally run out of the plain coloured dresses so I turned my attention to the leopard print dress in the same shape. I found a gorgeous Dylon Machine Dye called Tulip Red and knew it would look great. Yes! This was exactly the look I wanted. Something bold and rich…and it looks terrific without a vest underneath! I was obviously in the mood for taking lots of photos at this point as I went to the trouble of adding a belt with this dress and taking some extra snaps – I think it works really well. 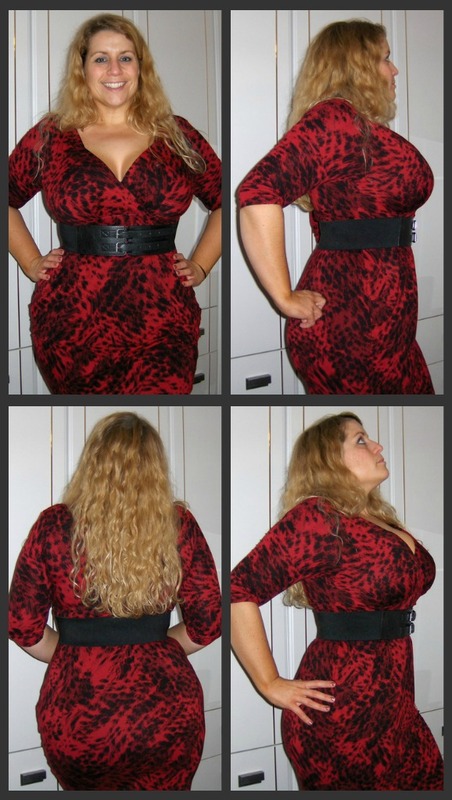 So now I can wear my red animal print dress with my red animal print lingerie underneath! I have three plain black Wallis dresses in my wardrobe and I am toying with the idea of using Dylon Pre-Dye on a couple of them to remove the black pigment and then having another go with Burlesque Red (as I love it so much and don’t have a dress properly in this colour yet) and a different colour (probably a teal – I have emailed Dylon to ask what two colours I should mix to get teal). But I am nervous that something might go wrong…however I suppose the worst case scenario would be that the black wouldn’t be completely removed at the Pre-Dye stage. In that case, I could simply buy a pack of black dye and go back to where I started. Hmm…could be a project for the weekends ahead! 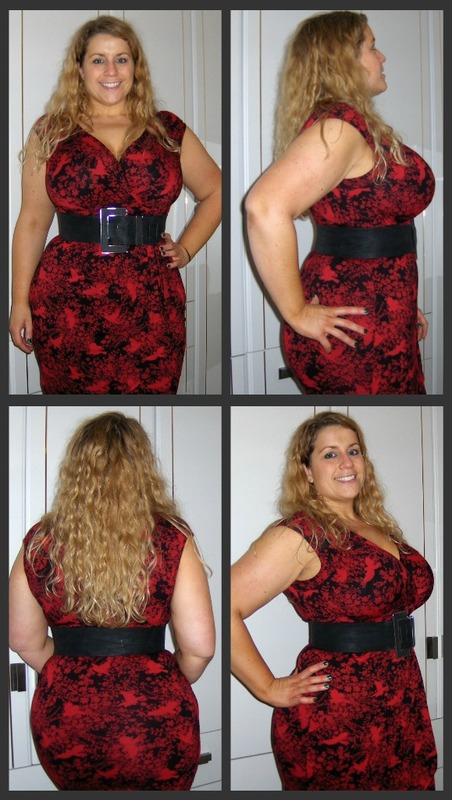 Now, on to the Dorothy Perkins birdie dress I recently bought. I got two at the time so one will remain (for now anyway…I have visions of it being dyed to royal blue…) in its original form and the other I bought to dye. Again, I used Dylon’s Tulip Red Machine Dye. I was so pleased with how this dress came out. Red is another colour that seems to suit me well in lots of different shades so it’s nice to have something else to choose from when I feel like having a crimson day. 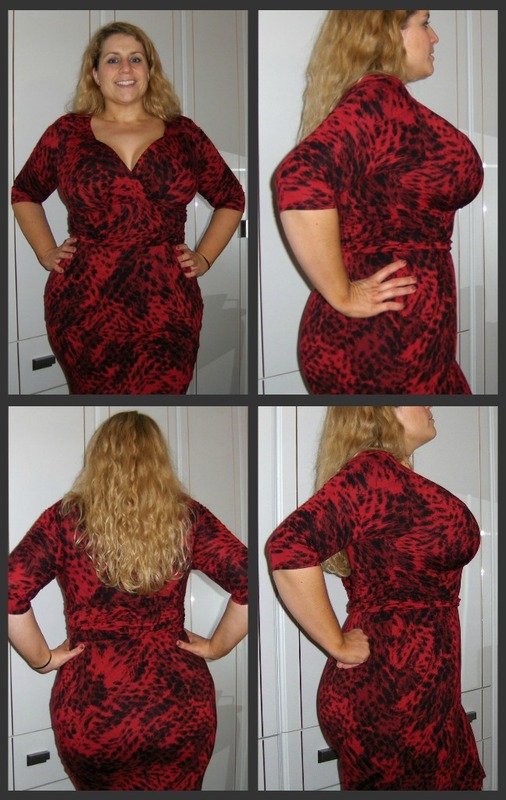 It does look fairly similar to my leopard dress in these pictures but the difference in pattern is more obvious in real life. And of course this dress is sleeveless so it’s likely I’ll wear it more in summer, or perhaps in spring and autumn with a shrug. I enjoy dyeing so much and I hope this has come across in this post. It’s exciting from start to finish – choosing the dye instore or on the internet, putting it into the washing machine and watching it start to mix together, opening the washing machine door at the end of the cycle to see what colour has developed, and waiting for the item to dry to see what the true colour is. And, for me at least, the most thrilling thing of all is knowing that I have got a uniquely-coloured item of clothing. Well, I suppose it’s possible that someone else may have had the same idea as me with the same garment but pretty unlikely I would think! – Make sure you check your garment’s fibre content before selecting your dye. Some fabrics will not absorb dyes like Dylon so a specialist dye may be needed. So, do tell me: have I tempted you to dye? Hey, can I ask you something totally unrelated to this post? 😀 I've been trying to see your Bratabase measurements on EM plunge bras to find out how much the cup width grows with one cup size. I found that they seem to vary a lot in different models. Do you find that the wires are wider in some EM PL bras than others? I thought that it might be just because you measures some bras new and some used or something like that…I'm asking this because I HAVE to find the right fit in EM. They are the best bras ever, but the wires should be a couple of centimeters wider. I'll go up a cup size in my next order, but I'm just thinking if there really is difference in the plunge bras width. I'm inspired. And you answered the only question I had about nylon thread not taking the dye. I wish it would so that women could dye my white Campbell & Kate shirts into any color they wanted. And it's not an issue if you don't mind the contrast stitching. I've got 3 very boring grey/black dresses and I was going to dye them but the instruction says not to use on polyester. Have you tried it yourself? Hmm…I haven't used Dylon machine dyes on polyester but you may wish to try something like this http://www.thedyeshop.co.uk/acatalog/Polyester_Dyes.html. Just make sure you read the instructions several times over to avoid mishaps. And be prepared that the item might not work out quite as you'd expected – for me that's half the fun of dyeing but sometimes it can be frustrating. You are a girl after my own heart. The only thing that annoys me when dyeing is polyester thread used to sew clothes because it never dyes…grrrr.Just about to embark on a dyeing spree with two BHS jersey dresses! Ooh hope it worked out well! I haven't dyed for a while now but always have my eyes out for the next project! Hi, thanks for the post. You look fab in the frocks. Did you hear back from dylon about what to use to get a teal colour? I'd really like to dye some pale blue jeans dark teal, I'm thinking of mixing blue and green like you did. Thanks! No, disappointingly they never got back to me. I think if you add green dye to an item that's already blue then you may get teal. However the shade of the original item and the shade of dye you choose will make a big difference to the end results. Hi Nicky, thanks for your comment. First of all, have you researched online to find ways of removing the stain? I'm sure there are lots of helpful links on Google. If you have, then dyeing is definitely an option. If you use a purple dye on a green dress then the end result will not be a purple. Instead it will be a brownish grey. Green and navy will make a kind of teal but I suspect it will be rather dark. I would advise trying a dark green as at least you know it will end up some kind of green. Again, try googling your colour options and see what comes up. Hope this helps! Would love your advice. I have a gorgeous lime green dress but spilt red wine on it which has left darker green patches. I couldn't find a nice green to cover it so I picked up a purple and a navy. I love purple but do you think it would work?